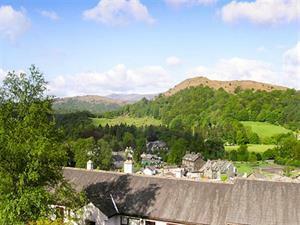 Fellcroft Self-cateringSituated in a quiet residential area above Ambleside, this modern 'upside-down' terraced property commands superb panoramic views over the village below across to Loughrigg, the mountains beyond and, to the north, the entire Fairfield Horseshoe. Although away from the hustle and bustle of Ambleside itself, a short, downhill walk will take you right into the centre of the village with its numerous restaurants, pubs, shops and cinemas. There are walks in the immediate vicinity without using your car with all the surrounding fells easily accessible on foot, including Fairfield, Wansfell and Loughrigg. For those wishing to tour the area, you will find Ambleside well-placed for visits to all parts of the Lake District and with Lake Windermere only a ten minute stroll away you can enjoy cruises or boat hire on England's largest lake. Accommodation: Access is at the rear of the property via steps and the decked area into the spacious hallway on the first floor. Light and airy lounge/dining room (TV, video, DVD) with large picture window providing stunning views over the village to the fells beyond. Comfortably furnished with real flame electric fire and soft lighting. A double bedroom with kingsize bed offering outstanding views. Fitted kitchen with all major appliances. Also on the first floor is a shower room with large shower and basin, and a separate wc with hand basin. Stairs down to ground floor lead to a further twin bedroom and a games room with comfy easy seating and an additional dining facility, door to the patio. Family bathroom with bath with shower over, basin and wc. Fellcroft is carpeted throughout and has ceramic tiles in hall, kitchen, shower room and wc. Fellcroft provides a relaxing holiday base to return to at any time of the year. Outside: Private parking for two cars. Front patio with mature shrubs, garden furniture and pedestrian access to the road. Decking at rear of property with garden furniture. Five minutes walk via path downhill to village centre or steps to Lake Road. Note: Please note that there is a stair lift at this property but not for public use. Situated in a quiet residential area above Ambleside, this modern 'upside-down' terraced property commands superb panoramic views over the village below across to Loughrigg, the mountains beyond. Fellcroft offers weekly bookings starting on Saturday. All bed linen and fuel included. Membership to Low Wood leisure club included.